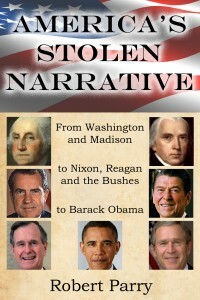 From Journalist Robert Parry: When my new book, America’s Stolen Narrative, returns from the printers in the next few days, I am setting aside the first 250 copies as part of a critical fundraiser to keep Consortiumnews.com afloat. If you donate $100 or more now (or if you have in the recent past), I will send you an autographed, numbered copy as a thank-you gift for your tax-deductible donation. After your donation, just send me an e-mail at consortnew@aol.com telling me where to ship the book and prescribing any special inscription that you might like. 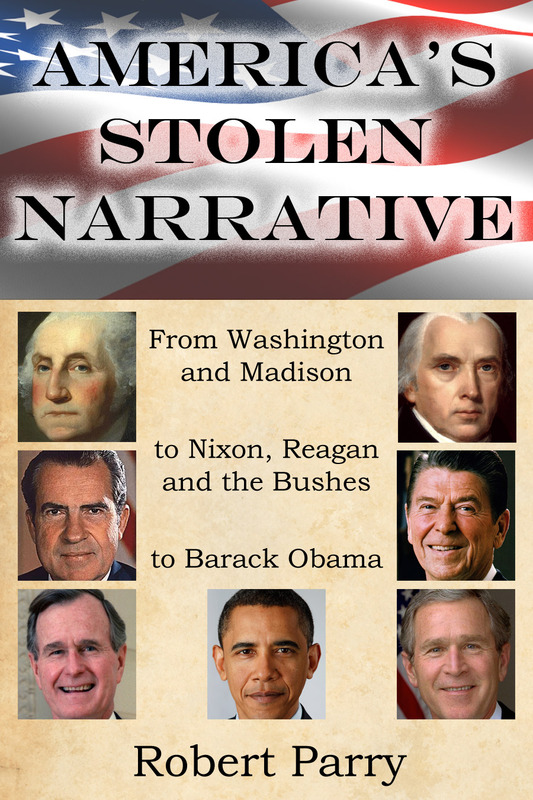 America’s Stolen Narrative is subtitled “From Washington and Madison to Nixon, Reagan and the Bushes to Obama.” The book’s opening chapter challenges the Tea Party misinformation about what the Framers were doing when they scrapped the states’-rights-oriented Articles of Confederation in favor of the Constitution. The book also reveals new historical evidence showing how Richard Nixon’s “win-at-all-cost” political tactics became the playbook for the modern Republican Party and why Democrats have shied away from the hard work of accountability when faced with GOP crimes. America’s Stolen Narrative rewrites the history of the latter years of the Vietnam War and explains why Nixon started his infamous “plumbers” unit, which later got caught at Watergate. The book then traces how Nixon’s playbook of dirty tricks was passed down through the years of Ronald Reagan, the Bushes and now the Tea Party. The survival of Consortiumnews.com is also important to the book because it refers readers to original documents that exist at our Web site and, in many cases, no place else. ← Who’s the Real ‘Savage’? Thanks Rehmat & borat for the amusing, utterly NON-contextual/UNI-factor historical accounts (Jews committing the Holocaust?? Muslims responsible for warring-against/assassinating Lincoln?? etc, ) IF either of you REALLY believe your one-dimensional histories, then it’s got to be some really strangely skewed intellectual worlds you inhabit. You guys share a lot of characteristics with the ‘9/11 Truthers’ – – – and that’s NOT meant as a compliment..
Yeah, thanks for your support, guys.